We've really come a long, long way when it comes to special effects in movies. It makes sense that today's movies look great because of all our computer whiz processing power animation software. Back in the old days though? We had to rely on the magic of the movies. Seriously. Turning scale models that look like toys that kids wouldn't even want into gorgeous, timeless movie sequences takes real magic to pull off. 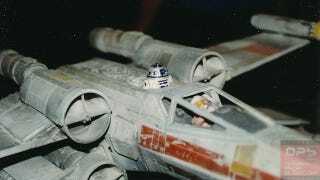 Just check out these models and props from Star Wars, recently revealed by Original Prop. The images were taken from the Lucasfilm Archives at Skywalker Ranch around 1997 and show the models in all their dusty glory. How is it possible that these toy models look just as good on screen as any CGI sequences we see now? Whatever. I know using scale models isn't exactly groundbreaking stuff here but the old film trickery methods are harder for me to wrap my head around than understanding computer generated graphics (like how a mp3 file makes more sense to me than a vinyl record). So to me, it's magic (alternatively: it's my impish brain believing what I see on screen is always real). Check out the full lot of Star Wars props at Original Prop.